REGISTRATION: All players must register prior to the end of round robin. If you do not register prior to the end of round robin, you will not be eligible to play. PROTESTS: Any protests must be done prior to medal games for 1st, 2nd or 3rd place. Protest fee is $50 for the protest & $50 for each question. Monies will only be returned for protest questions won. If you protest 3 questions, $50 protest fee + $50x3 questions = $200. If you win 1 question, you get back the protest fee & $50 for one question: $100. A protest must be made by the team manager to the umpire before the end of the game. At the time a protest is made, the Tournament Director needs to be notified. A ruling of the protest will be made by the protest committee. Such rulings will be final (not subject to appeal). ALCOHOL: ABSOLUTELY NO ALCOHOL WILL BE PERMITTED AT THE FIELDS. ANY TEAM FOUND WITH ALCOHOL WILL BE REMOVED FROM THE TOURNAMENT. THIS IS A LEGAL ISSUE FOR THE FIELDS AND A ZERO TOLERANCE RULE IS IN EFFECT. ASA: Standard ASA rules to be followed for all games unless superseded by NAGAAA's rules or set forth otherwise herein. BATS: All bats must be currently approved by ASA for play. Umpires will check all bats before the start of each game. ARC - Pitching arc will be 6 to 12 feet (and contact must be maintained with the mound per ASA rules). LINE-UPS: Teams must submit their line-up with player's names and numbers as well as subs and their numbers to the opposing team and the umpire on the line up cards provided before the start of each game. HOME TEAM: Home team will be determined by a coin toss for round robin games. Double elimination games have the higher seed as the home team with the exception for the Championship Game. Home team for Championship Game will be the undefeated team. Home team for the "IF" game will be determined by a coin toss. SCOREKEEPING: Scorekeeping is the responsibility of the home team. GRACE PERIOD: None with the obvious exception of allowance for completion of ongoing game/or time for movement to a new field. LINE UPS: You may use up to 12 batters, but not required. Team line ups must have at least 9 players ready to start at game time. COURTESY RUNNERS: 1 per inning and can be any player on the roster. BLOOD RULE: No player can play with a bleeding wound; umpires will make reasonable accommodations to tend to injuries. JEWELRY: Must be removed before play. Small stud earrings may be taped. TIME LIMITS: For all round robin games and double elimination games, no new inning to start after 55 minutes. If an inning starts, it is to be finished. TIE GAMES: Ties will be allowed in round robin games. In double elimination games, the International Tie-Breaker rule will apply. The Championship Game will have no time limit and will be played with two umpires. COUNT: All games will have a 1-1 count, with a courtesy foul. In the event of inclement weather, the tournament may revert to a one-pitch format at the discretion of the Tournament Director or his proxy. MERCY RULE: 15 runs after 4 innings, 10 runs after 5 innings. This applies to all games round robin and double elimination games. UNIFORMS: All teams must have matching uniforms with numbers clearly marked on backs. In addition, appropriate dress is required at all times. Revealing clothing for either men or women is not permitted. Umpires may ask offending players to change into appropriate shirts or pants/shorts. GAME SCORES: Umpires are to record the scores for each game on the sheet provided. At the end of round robin, they are to provide the sheet to the registration table. PENNYPACK FIELDS: Any ball that rolls onto or hits the parking lot shall be a dead ball and a ground rule double . All teams rated 185 or lower. No players rated over 19 are allowed on a B division team. All teams rated 135 or lower. No players rated over 14 are allowed on a C division team. All teams rated 95 or lower. No players rated over 10 are allowed on a D division team. Team is defined as the top 10 rated players on a team- not the entire roster. OFFENSIVE BEHAVIOR: Offensive Artificial noise makers are not permitted. This includes but is not limited to loud boom boxes, money shakers, horns, cow bells, and other such devices. Offending fans (either with offensive comments or noise makers) will be asked to stop, and teams may be subject to forfeit if fans are not kept under control. Umpires have the power to have offending fans removed. We are here to have fun and play softball! Any issues with rule interpretations or issues that rules do not cover will be governed by ASA rules. 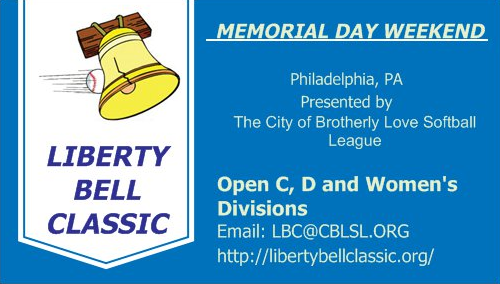 If no rule is in place, the Tournament Director (Bob Lenahan 215-341-1090 or Mike Lowe 856-979-2763) will have the final say in the matter. The Tournament Director may consult attending Umpires or others if necessary to gather information. The rules here govern everything so be familiar with this source.